Indiana PRSSA students are invited to take part in Half Day with a Pro scheduled for Wednesday, Nov. 14. This annual event gives PRSSA students the opportunity to job shadow PR professionals at PR agencies, nonprofits and corporate offices in the Indianapolis area. Students sit side-by-side with a paired PRSA professional to learn about their day to day responsibilities, office environment and PR tips for the trade. Click here to complete the Half Day with a Pro student registration form. The deadline is Friday, Oct. 19. 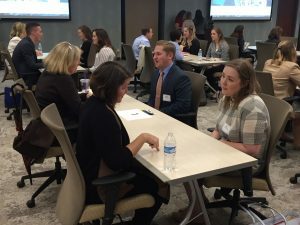 Immediately following Half Day with a Pro, students are also invited to attend the PRSA Hoosier Chapter professional development luncheon, which gives students the opportunity to network with other industry professionals. The topic of discussion for the luncheon is Real Talk about Fake News. *Students are responsible for signing up and paying for the luncheon separately, as well as managing their own transportation to/from the event. Registration for Half Day with a Pro is required to attend the luncheon. To learn more about the luncheon, please click here. PRSA Hoosier Chapter will award up to four undergraduate and/or graduate students scholarships ranging from $500 to $1000 during the November Hoosier PRSA luncheon on Nov. 14, 2018. The deadline to apply for both the undergraduate and graduate scholarships is Oct. 31. Click here to apply for a PRSA Hoosier scholarship. Each chapter is entitled to file for one $100 aid request per academic school year. Chapters may use the aid for any PRSSA sanctioned purpose. All chapter aid requests for the 2018-19 school year must be submitted by Dec. 1, 2018. Click here to fill out the chapter aid request form. The Hoosier Chapter has more than 370 active professional members with varying backgrounds and expertise. Interested in learning from a PR pro at an upcoming chapter event? Contact us and we will help set it up. Discounted student rates are offered at most PRSA Hoosier professional development events, including luncheons, which take place every other month. Click here to register for upcoming events for your chance to network with industry professionals. To communicate effectively with your chapter, we ask for updated officer and advisor contact information each year after chapter elections. Send us an email if your chapter leadership changes during the 2018-19 school year. Are you a college senior interested in becoming a PRSA Hoosier Chapter member after graduation? Contact us for membership (and perhaps discount) information!